A packed-out boat-end start line in 5-10 knots of building nor ‘east sea breeze this morning saw not only the first day of summer, but the start of the final Audi Centre Sydney Blue Water Pointscore (Audi Centre Sydney BWPS) series before the Rolex Sydney Hobart Yacht Race. Forty competitors have started in this year’s Bird Island Race, the shortest and fastest of the Audi Centre Sydney BWPS, and with conditions created a level playing field, this year’s race is anyone’s game. “We are going to win” said the invariably confident Shane Kearns from his S&S 34 Komatsu Azzurro – the smallest boat in the fleet – before the 1000hrs start. Providing strong competition for the smallest boat in the fleet, however, will be some of the largest. Four TP52s: Matt Allen’s Ichi Ban, CYCA Rear Commodore Dr Sam Haynes’ Celestial, Peter Wrigley & Andy Kearnan’s Koa and Matt Donald & Chris Townsend’s Gweilo are currently racing north in that order after an exciting tussle off north head saw the lead change with every cross. Shadowing them closely is Michael Cranitch’s LC60 Triton, with Hugh Ellis’ RP63 Voodooand Sean Langman’s newly-christened RP 65 Naval Group ahead. All of these teams will be using this race as preparation for their 628-nautical-mile journey to come on Boxing Day. And no boats will be watching each other more closely than the three super-maxis at the head of the race. Riding the building nor ‘easterly breeze Jim Cooney & Samantha Grant’s Comanche has overtaken Pater Harburg’s lighter-wind-favoured Black Jack as they race past Bateau Bay, only 12 miles from the turning point. 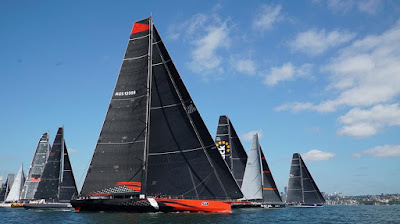 Christian Beck’s InfoTrack, after setting, resetting and setting their sails again down Sydney Harbour is also rising to the occasion, and the building breeze, hunting down their same-sized competitors. Some very close racing is also being had in the bulk of the fleet with almost three quarters of the competitors spread between just an eight-nautical mile field. This pack including the likes of 2017 Blue Water Pointscore champion Tony Kirby’s Ker 46 Patrice, as well as this year’s Cabbage Tree Island Race winner CYCA Vice Commodore Noel Cornish AM’s Sydney 47 St Jude. Kevin Whelan’s Reve, another stalwart of CYCA’s racing program, is towards the back of the fleet. With only Komastu Azzurro trailing, the team aboard Reve will surely be spurred on by the almost-incessant ‘we’re winning, we’re winning’ coming across the water from the little blue boat behind.